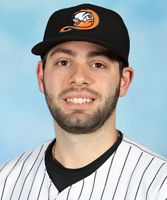 Healy begins his first season with the Ducks and eighth in professional baseball. The right-hander has spent time during all seven seasons of his career in the Oakland Athletics organization while spending part of the 2018 season in the Seattle Mariners system as well. He compiled a 1-1 record with a 4.06 ERA, one save and 33 strikeouts over 31 innings year between Double-A Midland (Athletics) and Triple-A Tacoma (Mariners). The Massachusetts native reached as high as Triple-A in 2014, 2016 and 2017 with the Athletics organization, combining to make 119 appearances at that level. The 28-year-old’s best season came in 2015 with Midland. He appeared in a career-high 45 games and posted a miniscule 1.95 ERA along with a 3-1 record, three saves and 53 strikeouts over 55.1 innings of work. The Ithaca College (N.Y.) alum has made 249 career appearances, totaling a 15-12 record, a 3.24 ERA, 28 saves and 401 strikeouts to 132 walks over 319.2 innings of work. Healy was originally selected by the Athletics in the 23rd round of the 2012 amateur draft.